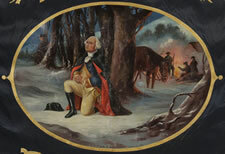 Jeff Bridgman Antique Flags and Painted Furniture - ELABORATE SILK BANNER WITH GILDED TEXT, SPECTACULAR BULLION TRIM, AND A BEAUTIFULLY PAINTED RENDITION OF GEORGE WASHINGTON'S FAMOUS "PRAYER AT VALLEY FORGE", MADE FOR THE PATRIOTIC ORDER SONS OF AMERICA, PHILADELPHIA, 1901, BY LOUIS E. STILZ & BRO. 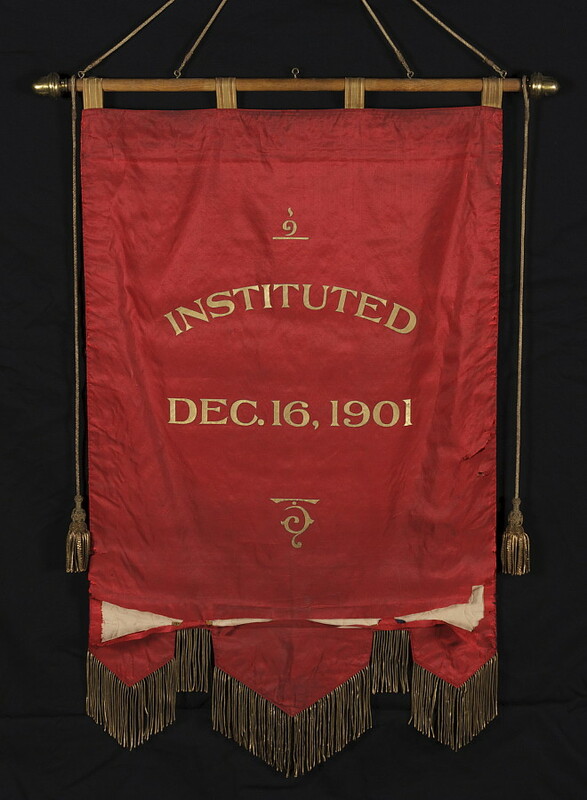 Frame Size (H x L): 61.25" x 36.75"
Flag Size (H x L): 40.5" x 28.5"
Many silk banners exist that were produced in this basic format, for the many fraternal organizations that thrived during the second half of the 19th century and the beginning of the 20th. Most are beautiful, but this one is extraordinary on all accounts. One of the most elaborate that I have ever encountered, it was made for the Patriotic Order Sons of America (P.O.S. of A. 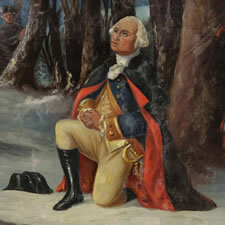 ), a fraternal organization to whom Washington was a patron saint. The chapters of the P.O.S. 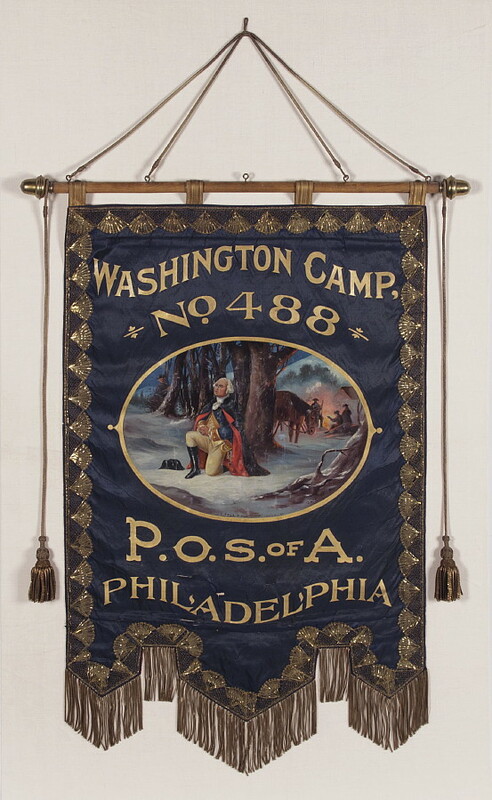 of A. were, in fact, called "Washington Camps", and lots of great folk art from this organization survives to remind us of their activities, all of which have patriotic colors or motifs of some nature. In the center of the blue silk banner is an oval medallion with an oil painting of George Washington's Prayer at Valley Forge. This legendary act was painted by numerous artists. 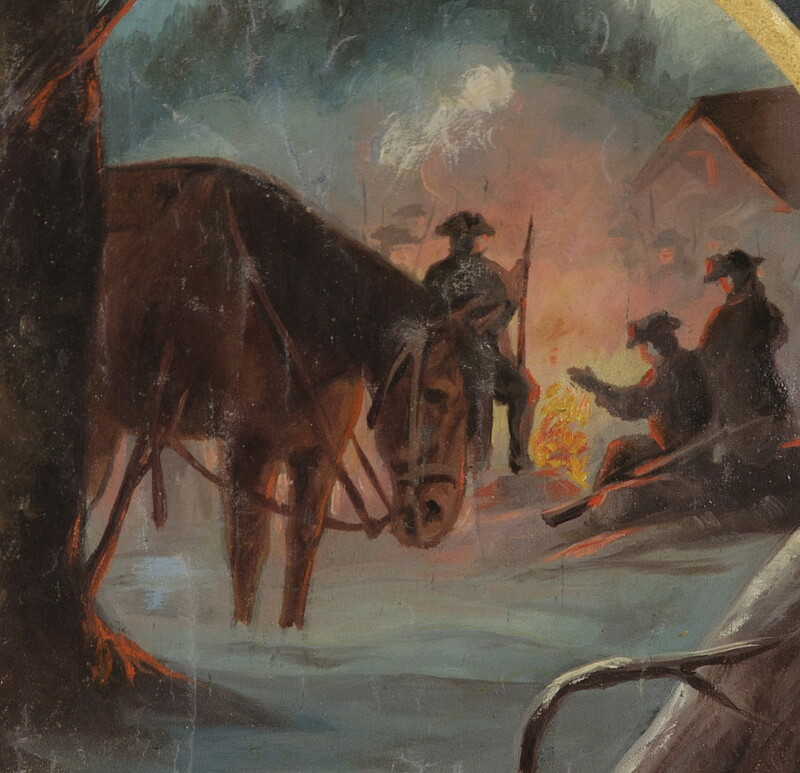 Flanking above and below is the following text: "Washington Camp. No. 483" and P.O.S. of A. Philadelphia". 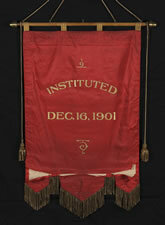 The reverse side of the textile is backed in red silk, on which is painted "Instituted December 16th, 1901", with scrollwork above and below. 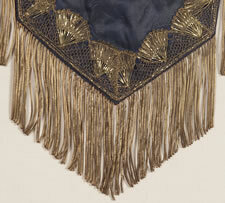 A border trimmed with some of the most fantastic metallic bullion fringe that I have ever encountered, in the form of repeating fans, runs the perimeter of the textile, which has a fancifully scalloped edge along the bottom. Blue silk tabs are affixed along the top. These hold the banner to a wooden dowel, capped with acorn-shaped brass finials. 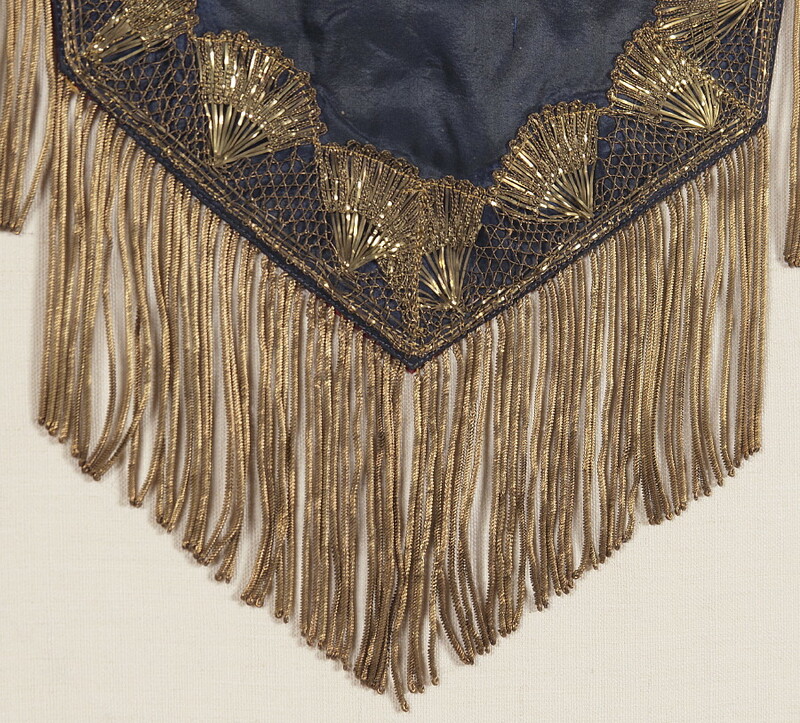 Four lengths of bullion cord taper up to a peak where the banner would be hung, and two hang down the sides, each of which is finished in an unusually elaborate bullion tassel. Bullion trimmings of this kind were produced in Paris. 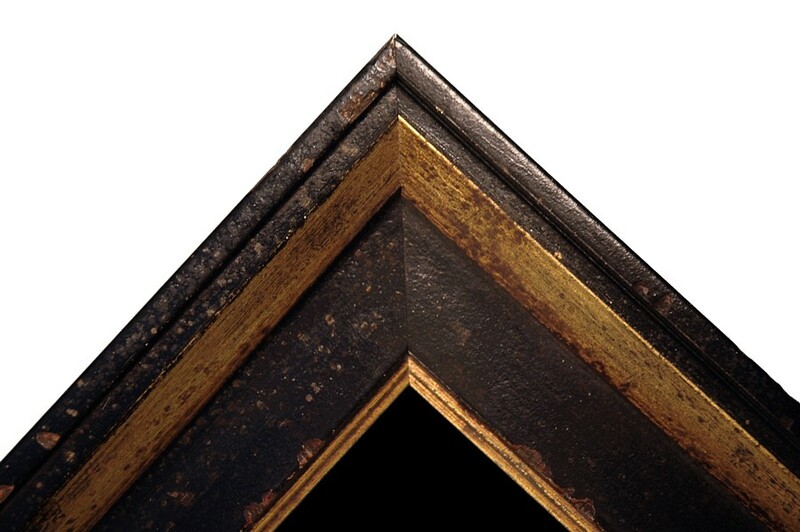 While their composition changed during the late 19th century, during the Civil War and prior it was actually spun from a mixed metal comprised of approximately 2% gold bullion and 98% sterling silver. The P.O.S. of A. was founded by a Philadelphia physician in 1853 and is one of America's eldest patriotic and fraternal societies that is still in existence. It once had several hundred lodges with several thousand members in the United States of America and its territories, but is now only found in Pennsylvania, North Carolina, New Jersey and Louisiana. 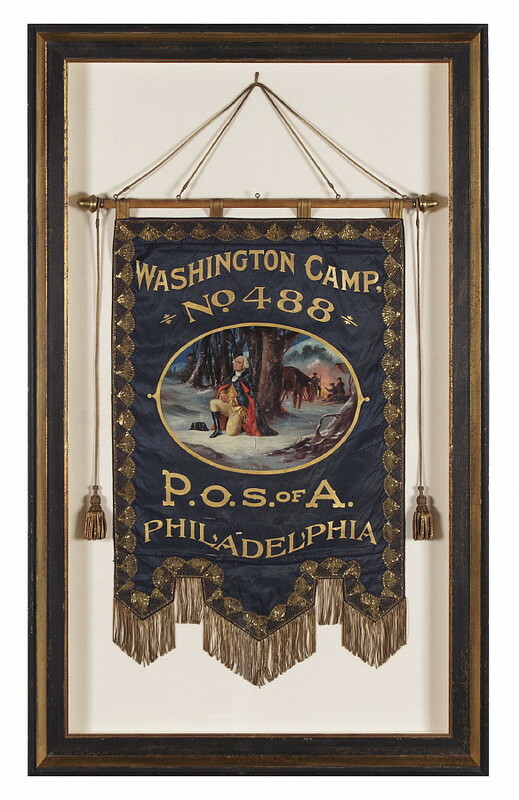 When the American Civil War (1861-1865) broke out, the first Pennsylvania volunteer regiments were members of the P.O.S. of A. So many members volunteered that only one Camp in Pennsylvania remained active. Sometimes entire chapters enrolled as one unit. The banner was made by Louis E. Stilz & Bro. (John H. Stilz), who began business as a hatters sometime around 1887 at 212 N. 9th Street and shortly thereafter expanded to regalia and military goods. Moving to 151 N. 4th St. around 1890, then 155 N. 4th St. in 1894, the firm went on to fill military contracts in 1901 for guidons (marker flags) for cavalry, artillery, and Indian scouts. It remained in that location until at least 1936, at which time the president was listed as L.E. Stilz, Jr. and its trade was listed as flags and military goods. The banner is signed by hand in the following manner: "L.E. STILZ & BRO. COMPY., PHILA. PA" along the bottom of the painting, after which the artist signed his/her initials, "G.W.L.". All-in-all, a spectacular piece of American folk art with a beautiful rendition of George Washington and one of the best patriotic banners that I have ever seen. Condition: There is some splitting of the silk fabric, particularly on the reverse. Silk produced during this period was typically weighted with agents that caused it to experience some degree of breakdown. There is some minor paint loss from creasing, resulting from when the banner was rolled, but the overall condition is extraordinary considering the materials and age and the textile was obviously well cared for. There is minor professional restoration to a crease in Washington's face.